Strange things happen to people in their life. This is a beyond comprehension event that happened to ME. Don't believe the garbage some sites chose to publish.... Believe the facts. I am running this class again, try to make some sense, of an unbelievable day. I am not allowed to print the message, as the FBI has requested of me. Calling me names because I opened up a private event is rather cheeky, don't you think? Distorting facts is also wrong. God bless the families affected by this tragic, perverse day. May this never, ever happen again. I wake up early, before 6:00 am every day, but on September 11th of 2001, it was a morning I could never forget. I went into my office and I saw the light blinking on the caller ID- strange for a call to come in the middle of the night, but I could see that a couple did- a pizza place in New Jersey. Weird. I went outside a grabbed the newspaper noticing Michaels Jordan's face in the corner. It was an article about a press conference scheduled for that day. Going back in the house, the phone rang in the kitchen. It was my mother calling bright and early, "Turn on CNN Gloria." I asked, "Why?" - "Turn it on honey." Click. She hung up. The shock filled me as I saw the tower in flames, the smoke billowing. Running through the house, I woke everybody up and went to the TV. Before our eyes a second plane struck the second tower. A few hours later, I went to the office and checked my messages. A scary, creepy messaged slithered in my ear. WTF? This can't be. The caller was slow, rehearsed, a message of unbelievable proportions. Although I didn't realize it at the time, it told a three-part story of wicked betrayal of the American people's trust. It told the past, the present and the future of our world. A prophecy with a chilling message is there, taking residence in my voicemail. I went to a pay phone at the Safeway near my house and dialed the FBI hotline number that was on the CNN ticker at the bottom of the screen. A woman told me to preserve everything about the phone call and that somebody would come by to check it out. I preserved. I waited. I waited. I called. I waited, I called, I called...And called...and called...Many things happened on my end as I tried to get this information to someone. I recorded the call and put it on a CD. I then did what any good manager would do; I asked our booking agent to book a tour for Soulfly to New York City and to New Jersey. 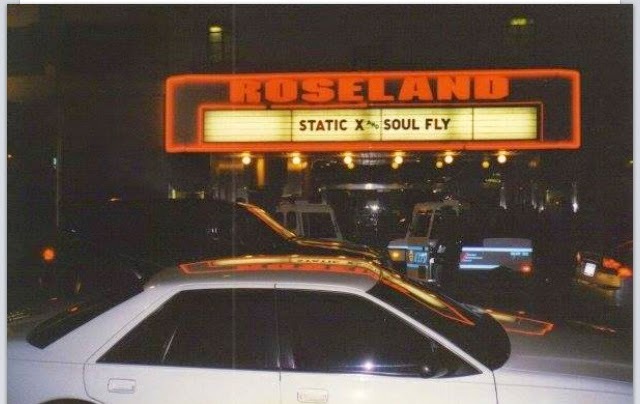 This gave birth to the Static X/ Soufly US Tour in 2002. And what's even worse??? Part three, the prediction and future visions mentioned in the call- many deaths for many years. A huge debt for America, someone talking with a crooked jaw (co nance), social security being cut... HOW DID THE CALLER KNOW? Why, simply put, he "listened" outside the apartment.